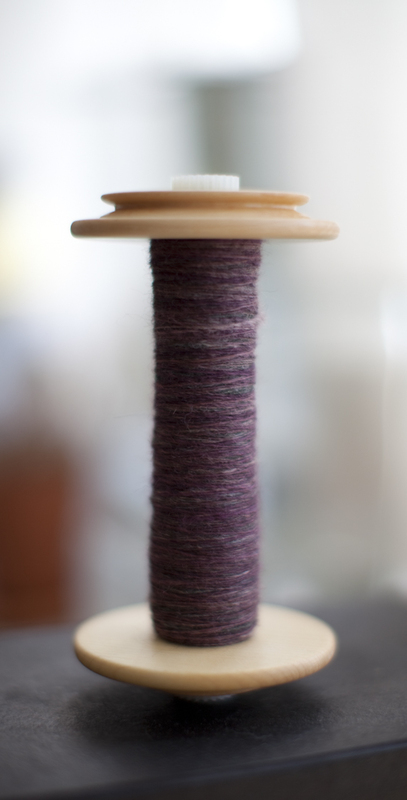 You'll often hear me say that I find spinning much more relaxing than knitting. In fact, I don't really find knitting relaxing at all. I'm not someone who can sit in front of the television and knit without a few mistakes here and there. So I find that I have to concentrate and focus quite a bit when I knit, which can sometimes be meditative because I end up blocking out the rest of the world. But, not relaxing. I found myself with a few days rest between designing for the Fall and Winter Collections. After knitting non-stop to get the Fall samples made in time, I needed a break. So I rifled through my studio, sifting through fabric, wanting to continue with my quilt top and realized that would take too much concentration as well. Out of the corner of my eye, my fiber stash waved at me. Long ignored, almost forgotten, my fiber stash appeared welcoming and nurturing to me in my time of crafty neediness. It's just the right thing! I find spinning so relaxing, almost hypnotic, and totally productive at the same time! And it's the perfect companion to watching the Olympics. I wheeled my office chair out of my studio, dusted off the Ladybug, plopped in front of the TV and spun up some BFL that a friend donated to my stash. It's from A Verb For Keeping Warm (100% BFL; colorway Abalone). This is my first attempt at something sort of resembling lace weight. We'll see what happens when I ply it. After plying, yarn seems to come out much thicker than I anticipate.